There is not a better shirt for a swordsman then the European Fencing Shirt. This light-weight shirt is perfectly designed to provide more than a modicum of style, without making the additional sacrifice of lost mobility and range of movement. 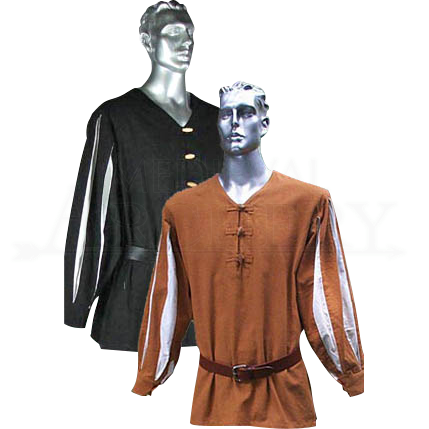 This European styled medieval shirt is made entirely from 100% cotton. This shirt is very breathable in addition to being lightweight. This shirt is collarless and features three toggle button fasteners on the front, which are used to close the open neckline. The full-length sleeves are decorated with colored slash stripes which run the length of the arm. The sleeves end in cuffs that feature fasteners on the inside of the wrist. All agility and mobility is left virtually intact, which makes the European Fencing Shirt a great choice to train, spar, and fight in. It is also a good choice to just wear when you are out and about at a favorite Renaissance fair. 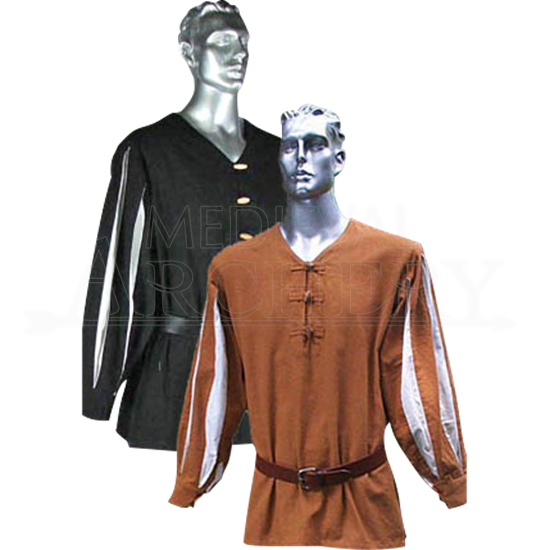 This medieval shirt comes in a variety of different color combinations.